The Resistance! 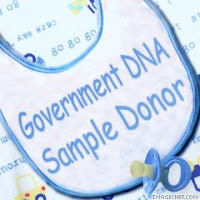 : New Law Forces Collection of DNA Of ALL Newborn Babies! New Law Forces Collection of DNA Of ALL Newborn Babies! (NaturalNews) In April of 2008, President Bush signed into law S.1858 which allows the federal government to screen the DNA of all newborn babies in the U.S. This was to be implemented within 6 months meaning that this collection is now being carried out. Congressman Ron Paul states that this bill is the first step towards the establishment of a national DNA database. • Use the newborn screening program as an opportunity for government agencies to identify, list, and study “secondary conditions” of individuals and their families. Brase states that under this bill, “The DNA taken at birth from every citizen is essentially owned by the government, and every citizen becomes a potential subject of government-sponsored genetic research.” All 50 states are now routinely providing results of genetic screenings to the Department of Homeland Security and this bill will establish the legality of that practice plus include DNA.